Six Flags Fiesta Texas is arguably one of the hottest theme parks in the country! It can be difficult to stay cool due to the nature of the park. Its young age presents a lack of larger trees and it also doesn't help that you are literally in a hole dug out of the ground. While the quarry wall atmosphere is striking and unique, it impedes plant growth and air flow. Below is a list of the top four recommendations I have for staying cool this summer at Fiesta Texas. Fiesta Texas provides numerous indoor dining and shop locations that have a good record of being consistently open to park guests. When it comes to dining, our two main recommendations are either Sangerfest Halle or Pete's Eats. Sangerfest Halle, located inside the park's Spassburg area, is great in multiple ways. Firstly, they have the widest selection of food found at the park. There is plenty of seating, especially if you have a larger group, due to their food hall-like table setup. There are also bathrooms located inside Sangerfest Halle! On occasion, live entertainment can also be found on Sangerfest Halle Stage while you eat, though no permanent entertainment is scheduled this summer. We picked Pete's Eats off of theme alone. Pete's Eats is your classic diner restaurant located inside of Rockville. Though their menu options are somewhat limited, it is a great place for people who are into the old architecture buildings from America's past. These are just two of the great indoor restaurant options. Other notable mentions include Old Blue's BBQ and Thirsty Buffalo Saloon in Crackaxle Canyon as well as Primo's Pizzeria in Rockville. Sangerfest Halle located in the park's Spassburg area. Pete's Eats located in the park's Rockville area. Heroes located in the park's Los Festivales area. Iron Rattler Mercantile located in the park's Crackaxle Canyon area. Not looking to eat? Fiesta Texas also provides a handful of shopping options that are also indoor. Heroes and Iron Rattler Mercantile come to mind when we think of good shops to stop at during your visit. 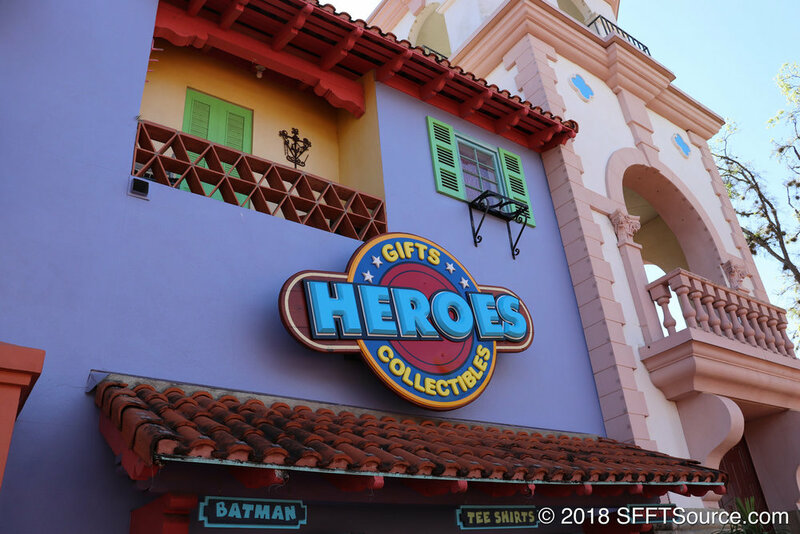 Heroes, located in the park's Los Festivales section, features all kings of DC-related apparel and souvenirs. The shop is large and, of course, is air-conditioned! Iron Rattler Mercantile is actually the exit shop for Iron Rattler. In here, guests can find various apparel items, Iron Rattler on-ride photos, and Iron Rattler-related merchandise. They also have bottled drinks and a freezer full of ice cream to help with the heat. There isn't one "bad" shop to stop at when you are at Fiesta Texas, however. Six Flags Mercado, also located in Los Festivales, features Looney Tunes and Six Flags-related merchandise and is a great place to stop in at. Another notable mention is Hollywood in Rockville. This shop features movie and TV-themed merchandise. Many larger attractions have exit shops as well. This includes Batman: The Ride, Road Runner Express, and Wonder Woman Golden Lasso Coaster. Bugs' White Water Rapids is located in Spassburg. Gully Washer is located in Crackaxle Canyon. 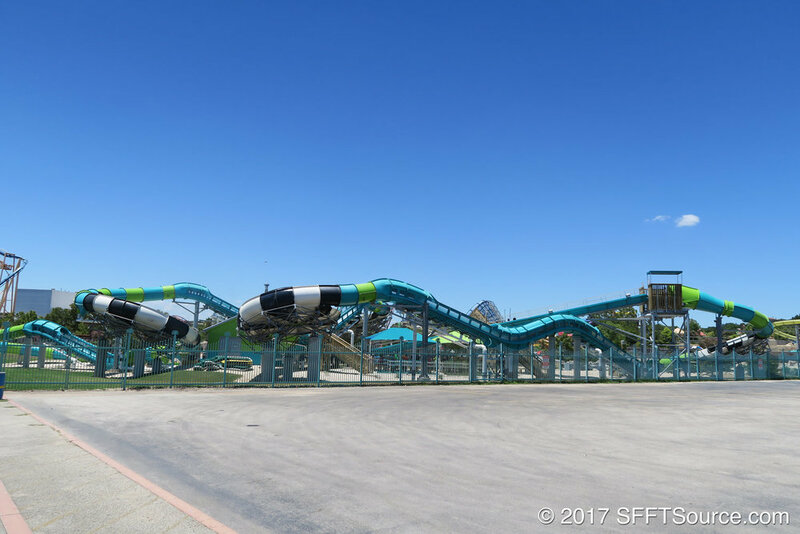 If you aren't wanting to take a visit to White Water Bay, you can always check out the two water rides that are found in the main park at Fiesta Texas. First up we have Bugs' White Water Rapids. This classic log flume attraction is actually really fun. It is one of the better log flume rides you'll find in the Six Flags chain as well. Bugs' White Water Rapids takes guests on a castle-themed adventure, featuring popular Looney Tunes characters. The ride also features multiple hills and opportunities to get wet. As you round a turn after the first drop, there is a dragon waiting to spray you. Make sure you sit on the right side of the log if you want to be sprayed. Another pro-tip for getting as wet as possible is making sure you sit in the front. While the drops of the ride don't get you particularly soaked, the top of the first lift hill has a special surprise for those sitting in the front row. The other water ride featured at Fiesta Texas is the Gully Washer. This is a rapids attraction in which guests sit in a circular raft and surf through the wavy trough. Gully Washer is a bit of a "luck" game in terms of where to sit as gravity determines the rotation and placement of your raft. The second half of the ride does feature a nice waterfall that is guaranteed to hit your raft. Gully Washer features guest-operated water cannons in one section of the ride. Guests can put in money and spray you whenever they'd like. Have a friend not riding? Set them up at one of these cannons to guarantee you get sprayed! Lastly, what is another great advantage to both of these rides? They both support Flash Pass. If you are a Diamond or Diamond Elite member you could also get your skip-the-line passes for both of these attractions! Perhaps one of the greatest parts of Six Flags Fiesta Texas? FREE WATER PARK! That's right...if you didn't already know, White Water Bay is free with your park admission. White Water Bay features a plethora of options, whether you want a relaxing day or are looking for the top thrills. Here's an overview of our favorite thrill rides in the water park as well as some great relaxing options for more laid back folks. Thunder Rapids Water Coaster is perhaps the most thrilling attraction of the water park. Texas Tumble is an exciting slide that fits multiple riders. Lone Star Lagoon is the park's Texas-shaped wave pool. In 2017, Fiesta Texas installed Thunder Rapids Water Coaster. This new attraction, the first of its kind in North America, is a compact water coaster that packs quite the punch. Guests board a raft and take a pleasant, calming trip up the first lift. However, after this the ride intensifies greatly. Guests are sent through a series of enclosed tubes, bowls, and shot up other hills as well. This is a high-thrill experience that guarantees you'll come off the ride SOAKED. What else is great about Thunder Rapids Water Coaster? It has a single rider line that will cut your wait down if you are riding by yourself! Texas Tumble makes our list of another exciting attraction found in White Water Bay. Texas Tumble is a Fiesta Texas original, meaning it opened with the park in 1992. Each raft, circular in shape, can fit multiple riders. Everyone within the raft is facing each other throughout the ride making it quite the interactive experience. While the intensity of the ride is somewhat high, it is still great for a family setting and doesn't feature anything over-the-top. One great thing about Texas Tumble? You do not have to carry your own raft to the top of the tower! 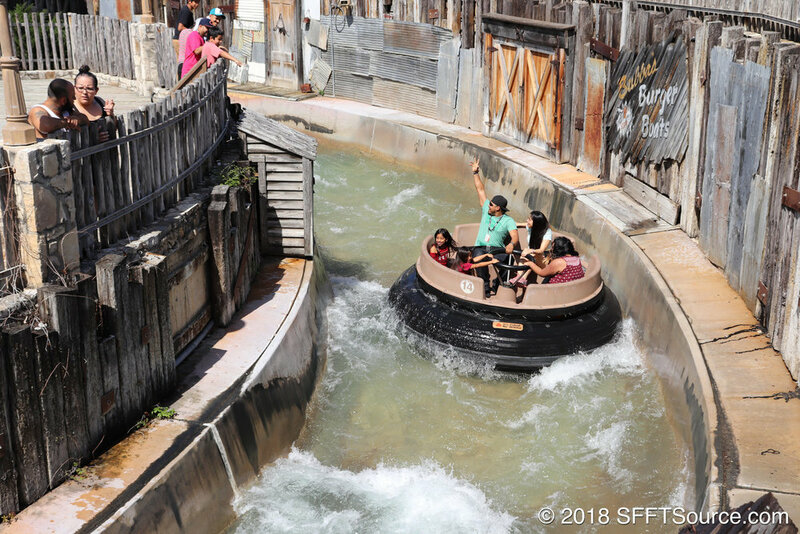 Lone Star Lagoon may possibly be the most famous feature of Six Flags Fiesta Texas. 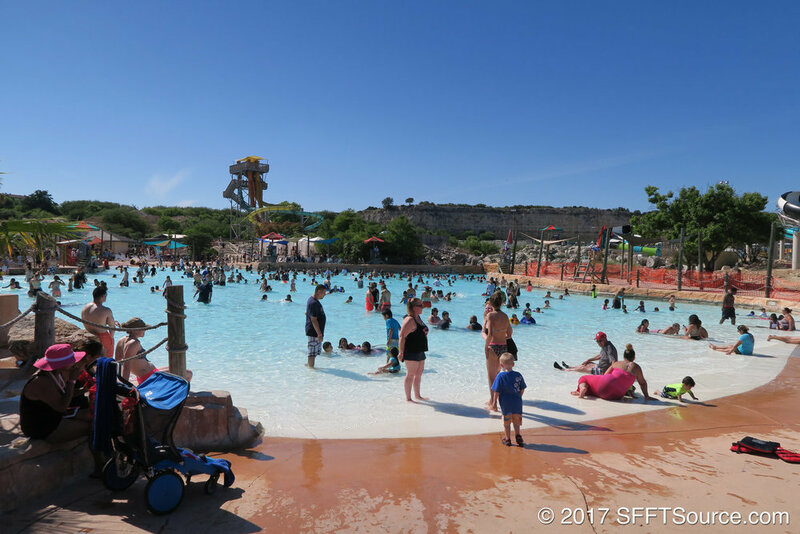 We recommend Lone Star Lagoon for those who aren't seeking a high level of thrill but still want to cool off on a hot day. This Texas-Shaped wave pool does not feature very intense waves and is great for guests of all ages. The wave pool also has tons of layout chairs surrounding its perimeter. Also, if you are a Diamond or Diamond Elite member, your reserved water park area is on the banks of the Lone Star Lagoon. Want to know everything about White Water Bay? Click on the button below to see a full listing of all attractions, dining options, and shops at the water park. Did you know that when Fiesta Texas opened in 1992 it was considered a "show park" and only had two roller coasters? Well, now you do! 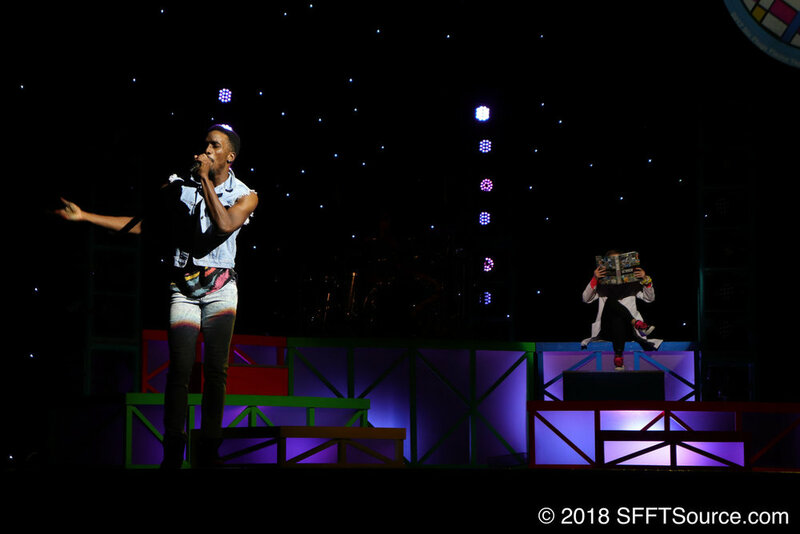 Six Flags Fiesta Texas has done their best to keep live entertainment a staple of their in-park experience for guests all season long. Totally Rockville playing in Rockville High School. Vinyl Countdown: Volume II playing in Zaragoza Theatre. For the summer of 2018, Fiesta Texas has produced two indoor show options. Playing in Rockville High School is the all-new Totally Rockville. 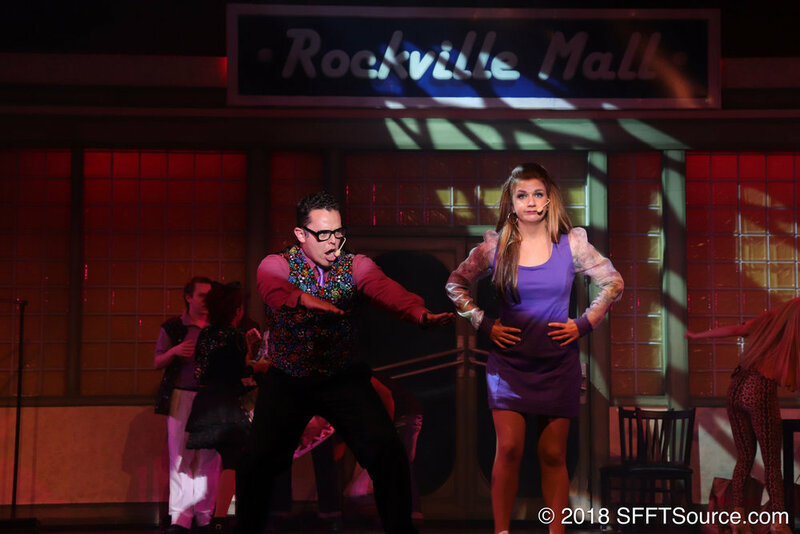 This show takes the past "Rockville High School" show concept and gives it an 80's twist. Playing over in Zaragoza Theatre is Vinyl Countdown: Volume II. This show, which is returning for a second season, features one-hit wonders from past decades. I personally enjoy Totally Rockville just because I'm into 80's culture and music. My favorite thing about Vinyl Countdown: Volume II is the fact that it has a live band and that the show features music not so commonly heard in theme park revue shows. This isn't the only line-up of entertainment found in the park. There are a few outdoor options if you dare stay in the shaded heat. Both V!BE and ¡Bailando! are playing in Teatro Fiesta throughout the summer. These shows feature a live band, great singing, and impressive dancing skill that you'd be mistaken to miss. Finally, there is the Celebrate! Fireworks Spectacular. This is a nightly fireworks production that includes laser effects, fountain effects, and projections along the quarry wall with accompanying music. You won't find anything like this at any other Six Flags park in the chain. The best place to watch this show is from Lone Star Lil's Amphitheater. There is also reserved seating for Diamond and Diamond Elite members! Click the button below to see information regarding shows, including the daily show schedule. Still have questions? We encourage you to leave a comment below!